A group of unknown gunmen drove into Three Pagoda Pass town in Kyain Seikygi Township, at about 12pm, shot at and burned a house, belonging to a businessman with close links to the Burma army. An eyewitness to the shooting incident told Karen News the gunmen arrived on a pick-up vehicle and only targeted, businessman’s U Aung Tin Win’s house. A local religious leader, who asked not to be named, told Karen News that town residents were scared by the incident and feared it might be an attack on the town. The businessman, U Aung Tin Win, whose house was destroyed, is a well-known associate of the local Burma army officers. He sells cooking oil, petrol, metal and logs and is the main contractor for building roads and other construction projects in the area. 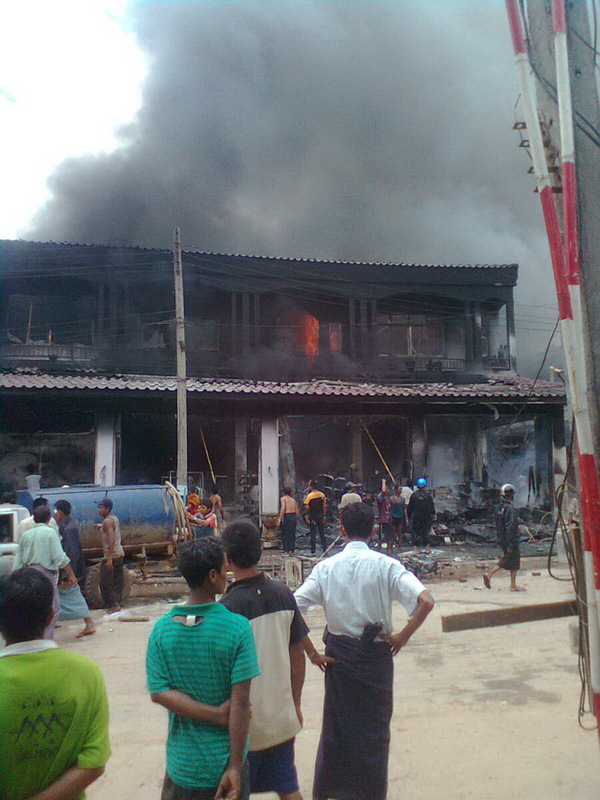 Residents said that there was yet no response from the Burma army regarding the shooting and arson. A Mon reporter said a resident was wounded in the shooting and a motorbike and a car were destroyed. Some residents blamed the shooting on Karen forces. In response to questions from Karen News the Karen National Union joint secretary Saw Hla Ngwe said. This is the third incident of urban warfare in Three Pagoda pass this month. The Sa Ya Pha [Military Affair Security Unit] office and Municipal hall were shot-up and bombed – a child was killed and three civilians wounded – and in another incident a motorbike attack by two gunmen wounded two Burma army soldiers. At the time of writing no group has claimed responsibility for any of the attacks.